Human Cities / Maker Mile, FabCity? Fabrication according to conventional wisdom is where raw materials are turned into finished goods on a large scale. The image that comes to mind is of industrial buildings with smoking stacks on the brown belt of a regional city and shipping containers packed with batches of 1000’s meeting a global market. FabCity is an alternative to this vision. It is an aspirational model for cities to become self-sufficient. The term grew out of the FabLab movement, a global network of maker spaces where individuals can make things using shared tools and machines more commonly seen in factories. An inversion of the traditional image of fabrication, a Fab City would be a place that makes most of what it consumes within the city and recycles the majority of its waste. 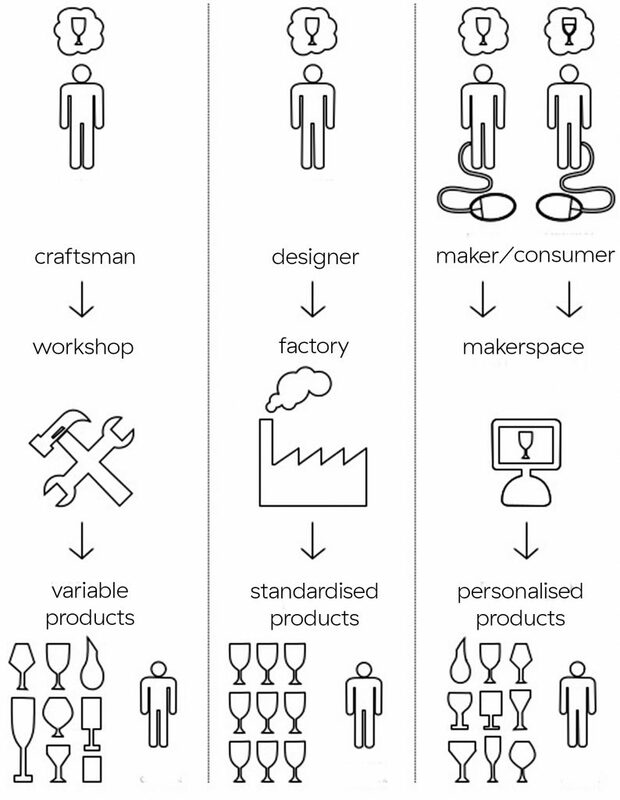 Maker spaces are seen as a prototype for this; rather than needing to ship 1000 stools from a factory abroad the Fab Citizen would download a design file and fabricate their stool in their local Fab Lab out of recycled materials suitable for digital manufacture. This future is one where manufacturing is distributed. The products people want and the food they need can be made and grown in a network of mini factories, farms and maker spaces scattered over a city and enabled by digital technology and the internet. A form of this networked making has been around since the 19th century – cottage industry was a system of fabrication used by British industry where manufacturing was carried out in people’s homes or workshops on a small, local scale and agents would put the parts together at a centralised factory. In a corner of east London these two forms of local manufacturing – the traditional light industrial workshops and the new fabrication laboratories can be found working side by side. The Maker Mile is a one mile radius creative cluster of over 50 makerspaces, fabricators, studios and workshops in East London. 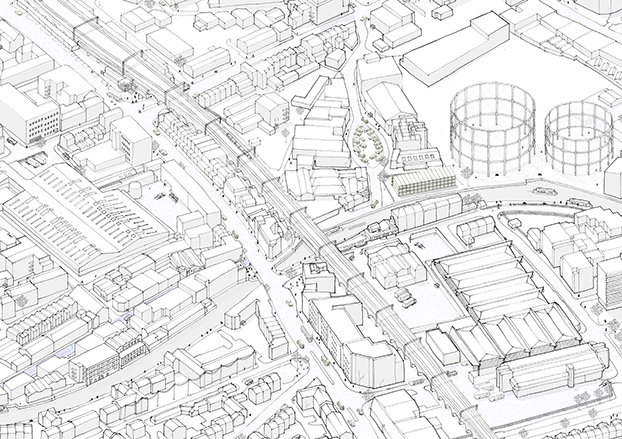 The area centres on where Mare street crosses the old industrial transport hub of the Regent’s canal which denotes the boundary line between the two boroughs of Hackney and London Fields. Dominating the skyline are the ornate cast iron landmarks of two Victorian gasometers built by the Imperial Gas Light & Coke Company in the late 1800’s. Their presence is a constant reminder of the area’s working past and in part thanks to their potential blast zone the architecture in their immediate shadow has remained (for the time being) an oval of warehouses and commercial buildings, home to printers, workshops and just over the water an iron foundry. The Maker Mile (www.makermile.cc) was mapped by Machines Room a FabLab just down the canal on Vyner Street; a cobbled cul de sac filled with wharfs and warehouses home to taxi mechanics, sign printers, and London’s oldest umbrella maker. Instigated by Clear Village and with support from Human Cities, Maker Mile launched during London Design Festival 2015 with Open Mile. 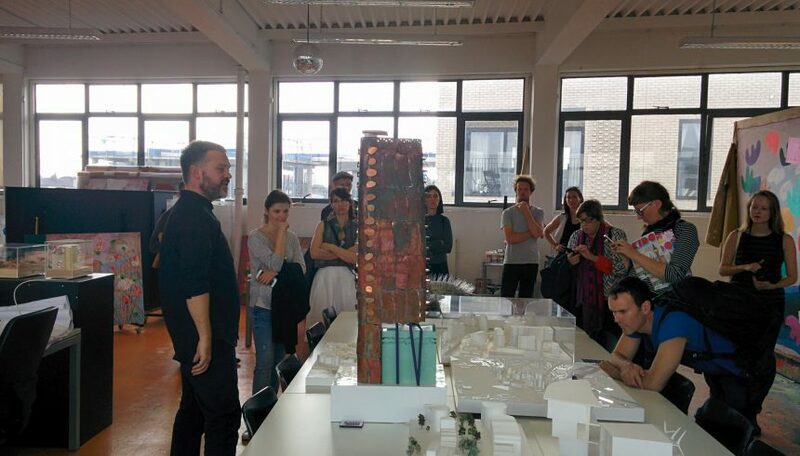 For one night 12 spaces opened their workshops and the public could get involved with hands on making and behind the scenes tours of workspaces. Over 600 people collected a map, made locally at East London Print Makers, followed the trail on a rainy Monday night and experienced the thriving community, that many, including those already working there, hadn’t realised was on their doorstep. One year on and for London Design Festival 2016 people were invited to join a guided trail of the Maker Mile. 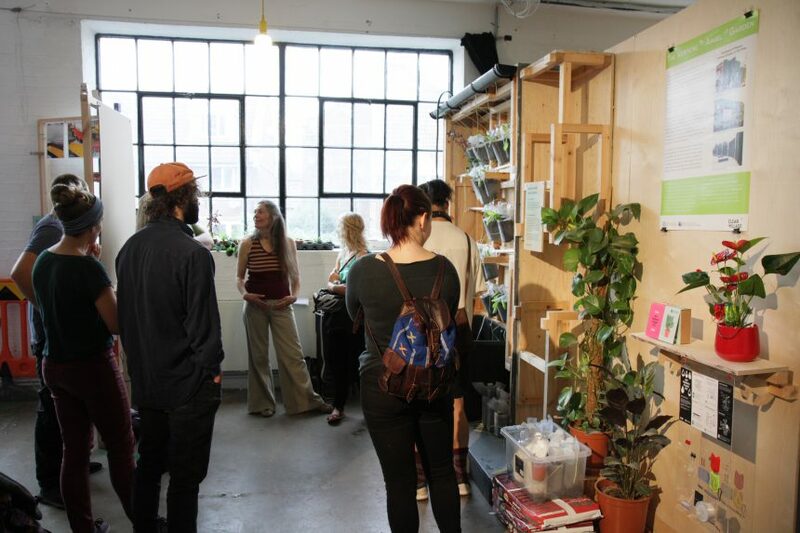 Visitors were shown both the fabrication spaces of tech newcomers and the longstanding workshops of local makers. 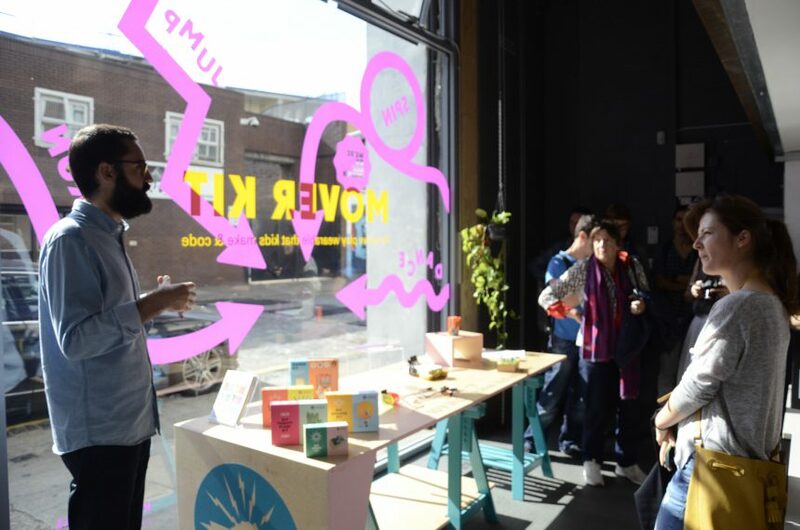 The tour started at the Fix Our City exhibition, hosted by Machines Room and filled with projects from the Maker Mile and showed the area to be a rich example of Fab City principles, showcasing local companies such as Sugru, SAMLabs, Technology Will Save us and Open Desk. Highlighting the FabCity principle of sourcing materials locally through recycling, they exhibited the Precious Plastics project; a diy recycling centre at the heart of the Maker Mile. 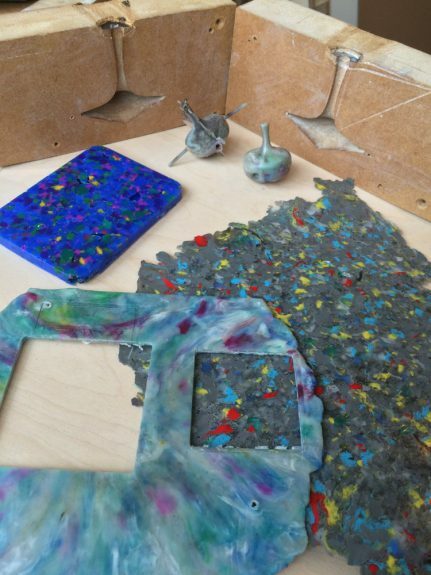 Collecting hundreds of empty milk bottles from local cafe’s they shred the plastic and then melt it down creating sheet material that can be formed into new objects out of the reusable HDPE. Another exemplar of FabCity principles in the Maker Mile is Opendesk, a furniture company with a difference. Rather than shipping tables and chairs around the world they share digital designs on their website. These can then be downloaded and manufactured locally. Machines Room is Opendesk’s local workshop and thanks to their proximity to a FabLab they can prototype furniture right next to their office. 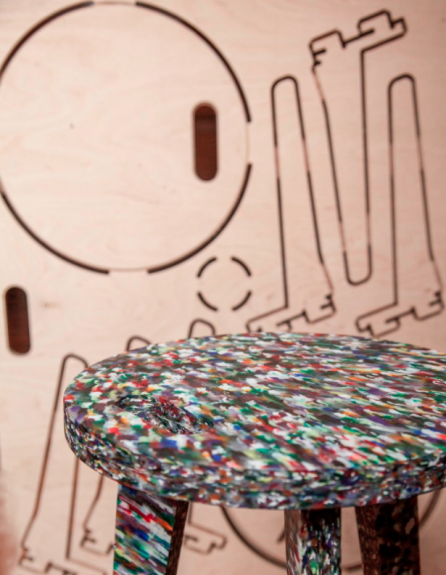 Exhibited in FixOurCity was Opendesk’s collaboration with Smile Plastics; a material manufacturer who recycle plastic – Opendesk had applied one of their CNC designs to a sheet of old drinks bottles creating a multicoloured flecked stool. 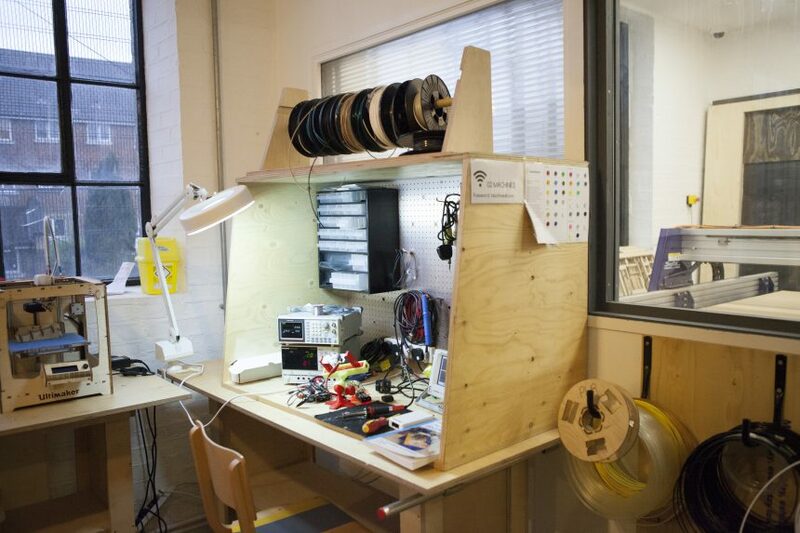 This new maker community of hardware start-ups was spearheaded by the opening of LimeWharf by Thomas Ermacora in 2012, a ‘cultural laboratory’ hosting a cluster of companies. Two of these are SAM Labs and Technology Will Save Us both learning-by-doing hardware startups educating future generations and preparing them for the 4th industrial revolution of internet connected things. When the Maker Mile tours visited them both were launching exciting new products. Technology Will Save Us was celebrating a successful Kickstarter campaign for their Mover Kit, a toy that reacts to movement with light and can be coded by children whilst the SAM Labs team were busy readying for a launch of the Curio kit, a version of their wireless construction kit that inspires kids to create internet connected vehicles. 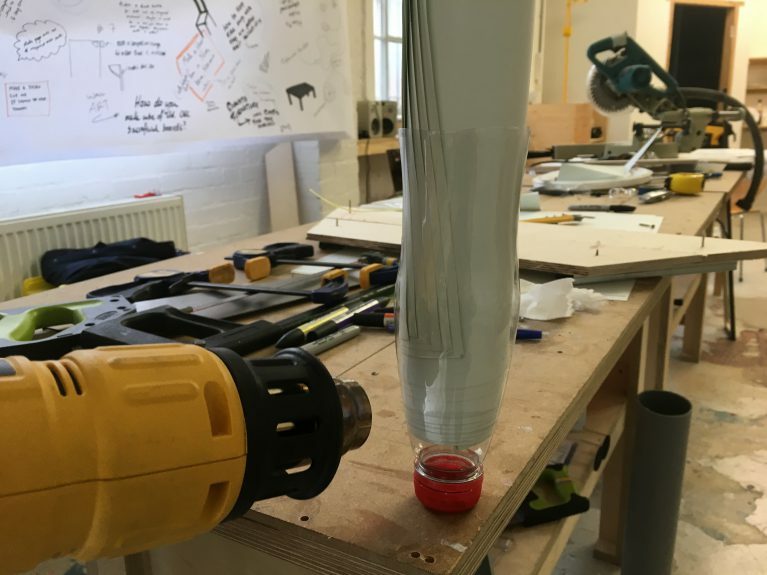 Also in LimeWharf, London School of Architecture and Royal College of Art Students created a pop-up makerspace open to the public and for the week their space became a local making testbed. The LSA students Timm Lindstedt and Dan Lee have been researching the Maker Mile over the past year and have explored local makers with great detail, interviewing, photographing and CAD modeling their spaces. The RCA, as a new generation of designers, used the Maker Mile as a ‘resource map’ and they went round the area, visiting local businesses asking for materials whilst inviting the public to give them briefs. They were given reams of paper by Keeley & Lowe; a printers with a 100 year history and in the Maker Mile since the 80’s. They specialise in finishing techniques and the tour was treated to demos of their converted lithographic presses that now folded and cut card using bespoke blades. Keeley & Lowe work closely with Calverts on the other side of the Oval. Calverts is a design and print co op founded in 1977. It is an inspirational place; the basement is dominated by their awesome lithographic printer and upstairs their design studio is decorated with witty prints and protest posters. 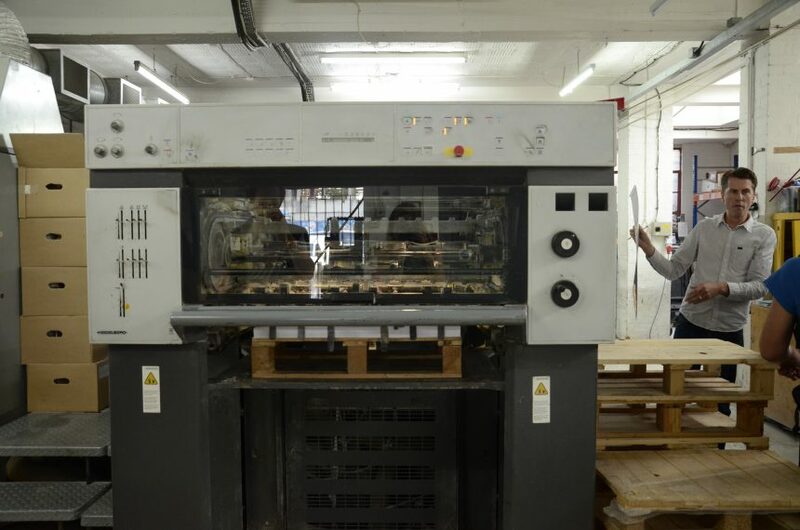 Their machines have been used by many local publications; they made the original run of Okido magazine and print the famous NoBrow comic whose office is up by London Fields. The highlight of the tours for many was James Hoyle and Son’s foundry. 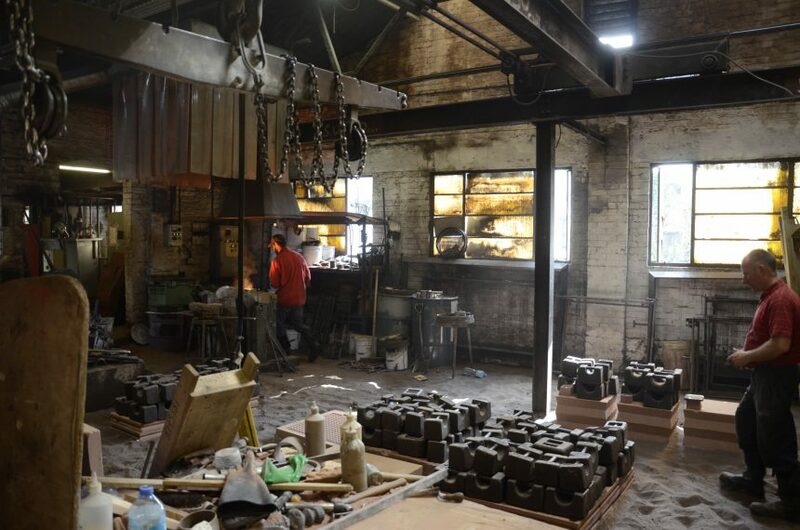 Right in the centre of the Maker Mile, the foundry has been operating since 1880. 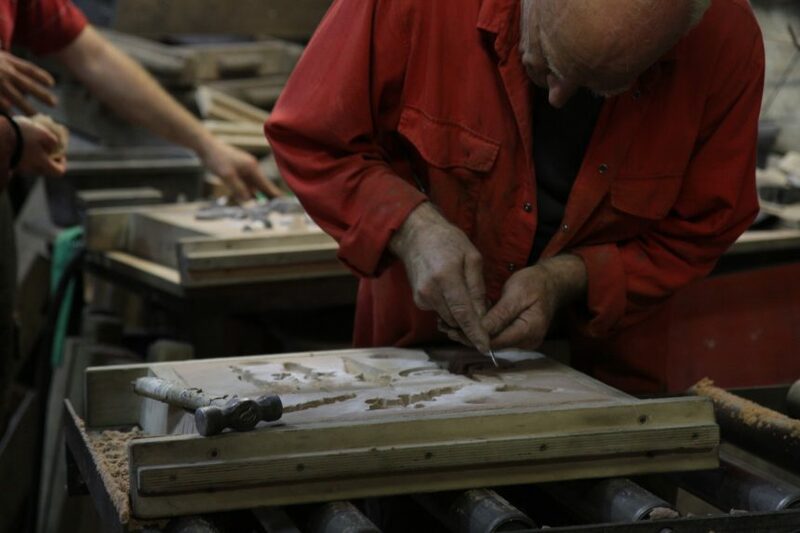 They produce hand crafted decorative ironwork and have a vast pattern catalogue – a resource that in an age of conservation means that their process in much in demand and the forge is constantly busy. 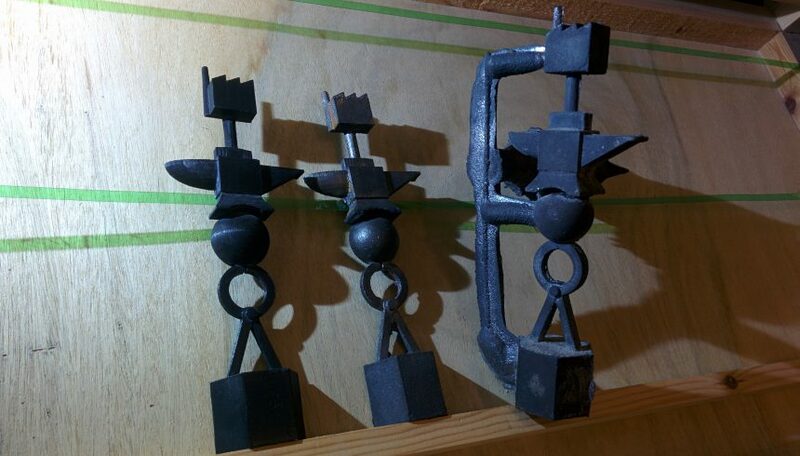 Their sand casting technique is thousands of years old and the London School of Architecture students worked with them to merge 3D printing from Machines Room with their iron pouring. They designed a totem made up of objects representative of local crafts and 3D printed it in two halves. This was then pressed into the sand mold and molten metal flowed into its imprint creating an object embodying the ethos of the Maker Mile – strengthening the connections between local makers. The Maker Mile is full of architecture practices such as Ackroyd & Lowrie, Adam Khan, Muf, Assif Khan… and the trail passed through Squint Opera and aLL Design. From the roof top balcony of Will Alsop’s airy studio one can see cranes and scaffold straddling the landscape. The area is changing and despite the high concentration of makers in the area, many of the industrial buildings are being redesignated as residential. 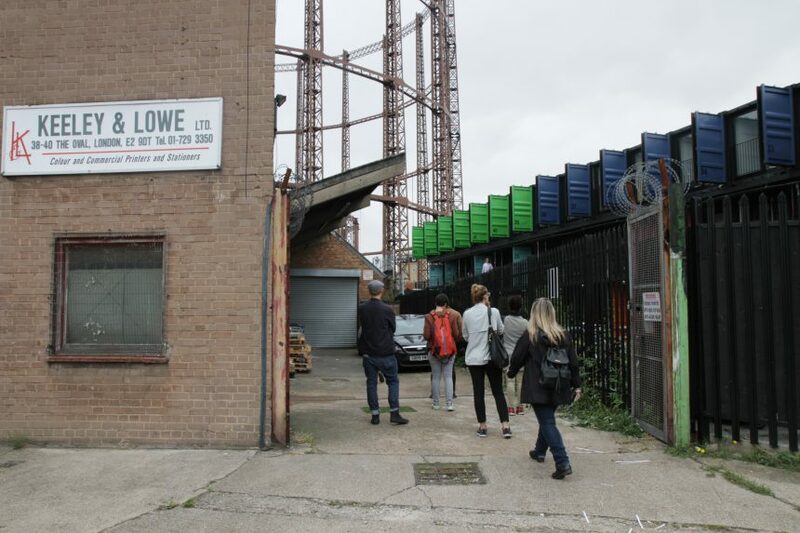 Keeley & Lowe have had to move after 30 years in their warehouse and East London Printmakers, stars of last year’s Open Mile event have been forced out by rising rents. These spaces for making are crucial for the future city; collaborations need to be encouraged and local fabrication protected. The Maker Mile is a starting point for this, by planting the flag in the ground for makers, hopefully awareness can be raised that this is a productive area. A FabCity will face the challenge of fabrication sharing space with homes. For future cottage industries to grow we will have to find ways for housing and manufacturing to coexist – with the help of Human Cities and Clear Village we can test this in the Maker Mile, the perfect prototype for a future FabCity.